Either Ryan Serhant wore Michael Stern down with an unsolicited library and won the gig to market 9 Dekalb Avenue — or he just made it sound like he did in his new book. In “Sell It Like Serhant,” the broker recalls wooing the developer of “Brooklyn’s first super-tall skyscraper” — a superlative repeatedly used to describe JDS Development’s 9 DeKalb — by persistently sending reminders of his existence. This initially took the form of an “architecturally interesting bookcase.” Serhant then sent a book a day to the developer’s office. But Stern insists nobody’s been hired yet to market his 1,066-foot tower. “We have not engaged any broker to market 9 Dekalb,” he said in a statement. He declined to comment further. When reached on Friday, Serhant said he hasn’t “been tapped for anything.” He wouldn’t elaborate on what he meant in the book. In the chapter where the Brooklyn supertall anecdote appears, Serhant extols the virtues of “following back” with clients to win or maintain their business. With this same unnamed developer who sounds like Stern, Serhant recalls pitching “his heart out” for a condominium in Park Slope (JDS launched sales in early 2016 at a 44-unit condo project at 613 Baltic Street). He didn’t get the job because the developer thought he was “too small,” according to Serhant’s book. So, Serhant “followed back” by sending the developer a 10-foot fig tree and a note that said “IMPACT,” according to the book. 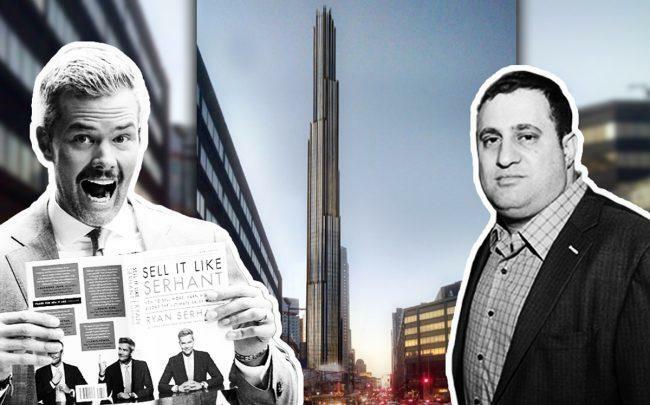 Two years later, the developer called Serhant and asked him to pitch on the Brooklyn supertall. Serhant notes that the book stunt wasn’t a fail-safe way to win a gig but served as a constant reminder of his team’s determination. Construction of 9 DeKalb, which will feature a mix of rental and condo units, began earlier this year. The Real Deal reported in August that JDS was buying out its partner, Chetrit Group, for $60 million.